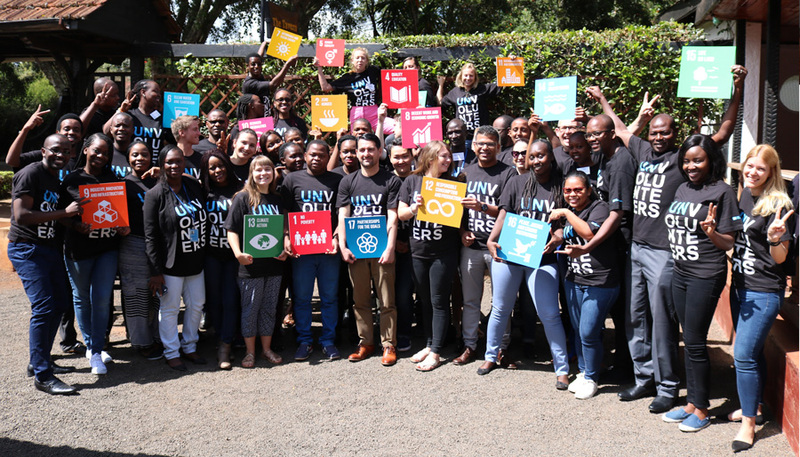 In the last week of September 2018, 40 UN Volunteers of 26 nationalities serving in 15 countries across the East and Southern Africa region gathered in Nyeri, Kenya, for a capacity development training on leadership, management and communications. The event, organized by the UNV East and Southern Africa Regional Office (ESARO), was designed to be part of a leadership journey for the participants broadly aimed at developing a critical mass of volunteer leaders to help improve the UN Volunteers’ overall experience in the region. The training was implemented through UNV Regional Capacity Development and Learning Facility (CDLF), a facility developed to support UN Volunteers' learning needs. The participating UN Volunteers enhanced their managerial and leadership skills for success in their assignments and contribution to Sustainable Development Goals (SDGs) while facilitating learning and experience sharing between UN Volunteers from different locations. The participants also utilized UNV’s online learning system, eCampus, as a platform for off-site engagements among themselves. While opening the training, the UNV Regional Manager shared a real-life leadership journey of his personal experience. "Whatever your path in life is, find your potential, and stay true to it, " said Njoya. "Your community sees you as a beacon of hope. In the eyes of your communities, you represent something different, something powerful, and this potential comes with huge responsibilities of service.” He also advised the volunteers to always seek mentorship to guide them on their volunteer journey. For the four days, the UN Volunteers explored various meanings and models of leadership as a collective practice; the critical role of strategy and management; UN Volunteers’ role in achieving the SDGs and communication skills for sharing impact stories. Through interactive discussions and role plays, the UN Volunteers also covered critical areas of personal development such as emotional intelligence; effective feedback models; identity and inclusion; living and working in a cross-cultural environment; and peer support and knowledge-sharing. “The training has been an opportunity to share ideas and experiences and build on capacities and skills that will not only strengthen us in our roles but also that we can use to train other volunteers and build capacities in the regions and countries that we are working in, " said Loisa deWet, an international UN Volunteer working with UNICEF in Uganda. One of my key take-aways is from the meet-a leader session with the Regional Manager where I learnt that I don’t need formal authority to be a leader, but rather that leadership is about influence, self-discipline and building positive relationships. --Deogratias Nkurunziza, a national UN Volunteer with UNDP in Rwanda. The UNV ESARO Volunteer Advisory Board (VAB) was also launched at the event, with the board members getting an opportunity to interact with the UNV Regional Office to share the challenges, opportunities, plans and priorities for UN Volunteers in their respective countries. The Advisory Board, an initiative of UNV ESARO, comprise of serving UNV Volunteers under the Youth, National and International modalities across the region. They are expected to regularly advise UNV on better ways of engaging with serving volunteers and help enhance the engagement of UN Volunteer by UNV and their respective host agencies, particularly in context of implementation of the SDGs. At the end of the workshop, the participants reported having a better understanding of leadership, management and communication principles, particularly in the context of the United Nations. They have developed their personal volunteer impact stories and improved their skills to spread the word about the important service they are performing in the implementation of the SDGs. The participants emerged as Impact Leaders and will in the next months further roll out the same training concept to other UN Volunteers, and develop Volunteer Communities of Practices (COPs) in their respective countries.